The ArcEquine mimics the body’s natural biocurrents to boost the production of ATP within cells. ATP is the energy component of the cells and introducing a microcurrent from an external source into the body can increase ATP production by up to 500%, kick-starting and accelerating the body’s own recovery; allowing for the reduction of pain and inflammation, and for healing to start earlier. The ArcEquine Complete Kit includes: 1 x Leg Strap, 1 x Delivery Unit, 2 x Carbon Rubber Pads, 1 x Conductive Gel (250ml), 1 x Charger, 1 x User Manual. Replacement parts available individually. Sir Mark Todd, Andrew Hoy, Lucinda Fredericks, Sam Griffiths and many more leading equestrians all over the world. The shape and movement of the hock makes hock problems some of the most difficult to treat. 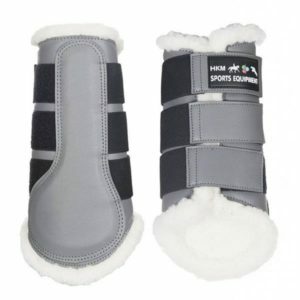 In response to the need for an effective hock treatment, ICE-VIBE have develpoed ICE-VIBE Hock, comfortable neoprene boots that wrap around the hock. Built in pockets hold the massaging panel that can be used on the inside or the outside of the hock and cold packs can go on either side of the hock. High quality leather, best workmanship and comfortable wear. Several attachment possibilities. Can be used with or without a bit. Padded to protect the sensitive bridge. Stainless steel fittings. Bit not included. Indispensable for training and schooling of young horses and for daily lunge work. It is gentle on the horse’s sensitive mouth. The softly padded noseband should be buckled in the same way as a regular noseband. The rings offer versatile possibilities to attach lunge reins or reins.